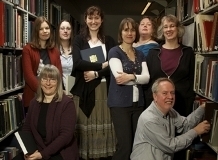 Once again, the Library is working with the Researcher Development Team to run the Images of Research Competition. Open to all Early Career Research Staff only (grades E & F), ‘Images of Research’ aims to engage the public in our academic research, showing the breadth and creativity of what is taking place at Exeter. It also provides you with an excellent opportunity to communicate your research to no specialists and fully grasp the public engagement agenda. You will also have the chance to win a ‘master class’ with the University Design Team. Runners up will receive prizes worth over £200 in value. All winning entries will be displayed for the public on the Streatham campus during ‘Universities Week’ 5-10th June and at the Penryn Campus 15-19th June. Finally, winning entries will be placed on permanent display in the Research Commons on the Streath am campus. The deadline for submission is Friday 1st May, 2015. This entry was posted in Research, Research Commons on 15th Jan, 2015 by cagale. Last year our Champions bought a total of 1023 items for library stock, selected by you: these included multiple extra copies of in-demand books, e-books of heavily used materials, DVDs to support film courses and brand new titles to support your courses. Do get in touch with them and help them spend up this year! This entry was posted in E-Resources, Student-Led Resourcing and tagged books, DVDs, e-books, Library Champions, students on 17th Jan, 2014 by cagale. Applications are now invited from all eligible students for the first round of funding this year: the first deadline is Friday 29th November. For further details, including what the bursary covers and how to apply, please see our Travel Bursaries webpage. This entry was posted in Student-Led Resourcing and tagged travel bursaries on 24th Sep, 2013 by cagale. Applications are now invited from all eligible students for the final round of funding this year: the last deadline is Friday 7th June. This entry was posted in Student-Led Resourcing and tagged travel bursaries on 26th Mar, 2013 by cagale. The Library is delighted to announce that after a successful first round of Travel Bursary applications, we have offered funding to 19 students to enable them to visit other libraries and archives. All visits are in support of final year projects/dissertations: students were asked to apply, giving details of why the visit would benefit their studies and showing the support of a member of academic staff. The successful students are from all our campuses (Exeter and Cornwall) and are studying a range of subject areas, including History, English, Law, Politics, Geography and Sport & Health Sciences. Applications are now invited from all eligible students for the current round of funding: the next deadline is Friday 1st March. This entry was posted in Student-Led Resourcing and tagged travel bursaries on 14th Jan, 2013 by cagale. Over the last few weeks, the Library staff have been busily attending training for academic reps and recruiting this year’s cohort of Library Champions. There are 23 Champion positions in Exeter and 7 in Cornwall, representing the taught programmes in all subject areas. In reality, even more people are involved as many positions are held on a job share basis. 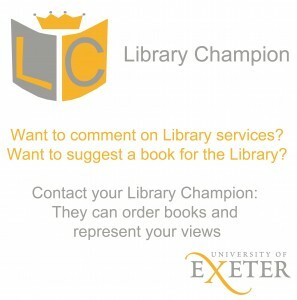 Champions are asked to collate feedback on Library services, act as a focus group on specific issues and report back via the staff/student liaison committee in their department. 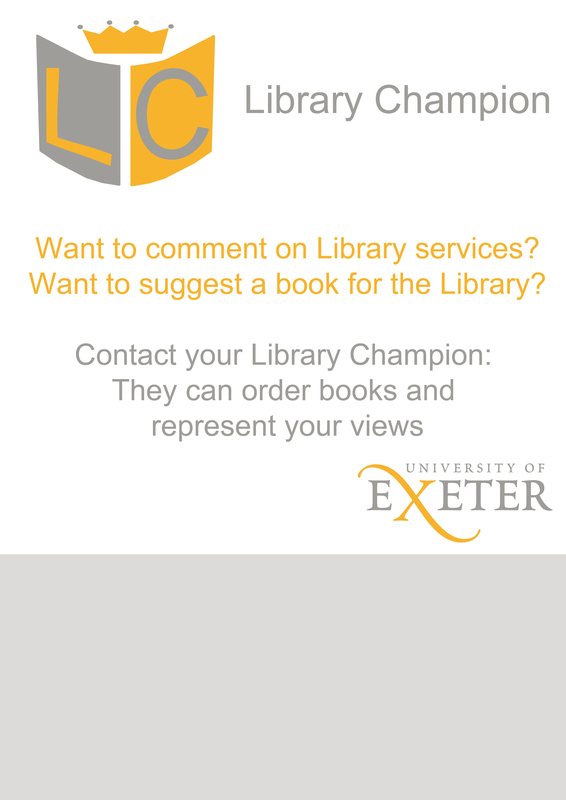 As part of the Library’s ongoing resourcing campaign, Library Champions have each been allocated a budget to spend on library books for taught courses. This allows them to quickly respond to students’ requests for extra copies, or for any other texts that the students need. Library Champions are now meeting with their Subject Librarians and will soon be promoting what they can offer amongst other students in Colleges. 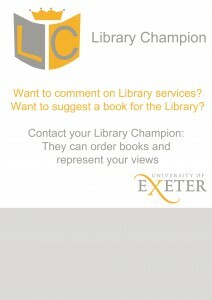 Look out for the Champions posters with your own Champion’s contact details and send them your feedback and book requests. This entry was posted in Student-Led Resourcing and tagged Library Champions on 15th Nov, 2012 by cagale.